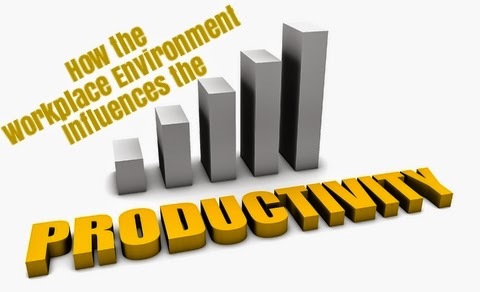 How the Workplace Environment Influences the Productivity of Employees? This Article is Guest Post. Workplace environment is a key factor in improving the productivity. Apart from their monthly remuneration, the employees also give importance to the environment they work on. If they are paid high and the workplace provided is haphazard, it’s sure that productivity level will decrease drastically. Let’s see how the workplace environment influences the productivity of employees. The first main thing in a work environment is the way the employee is treated in an organization. It is always an important factor that the manager should build a strong bond and friendly relation with his employees. Trust each employee and assign him some priority works. Give some vital roles to him in the organization which ultimately creates a mind set in him that he is recognized in his organization. The result is that he will have a good aim to work which finally results in the productivity of the business. Never treat him like aworker. Try to build a good rapport and be loyal to your employees. Give word of appreciation for the work they do. A word of praise always motivates the employees to work more, rather than lounging around. Try setting goals. Your freedom with the employees should not be in such a way that they take advantage of you. Set up a proper goal and guideline instruction in the organization, so that the employees strictly follow their work and also see that they work on more of productivity.It’s also important to see that the manager and the employer are travelling on the same wavelength in regard to work. The manager should try to create a team spirit, i.e. he should manage a unity within his team.This unity creates a feeling of respect in each employee which makes them put more interest to their work, resulting in a high productivity.Also it encourages an attitude of cooperation between the team members. Communication also plays an important role in creating a wonderful jovial environment. We can’t think of a workplace which is dull and lethargic. A dull business environment creates negativity around the atmosphere.Communication between the managers and employees can only strengthen the productivity. A manager should always be approachable. He should understand the issues and problems faced by an employee and try to support him as much as he can. An employee must feel that you are a happy person to talk with, understandable and concerned. And remember never to insult an employee in front of other employees. This can mentally upset the employee, which directly hits the productivity. Have one-on-one meetings with employees, discuss the problems and try finding solutions together. Give your employees a break when they need it. Any person would need a break from their daily humdrums of life. A break will in fact rejuvenate the mind of the employee which can increase the output. Offering rewards and bonuses is another main factor which keeps the employee stick to an organization. Employees feel more motivated and encouraged when they are rewarded, which ultimately helps in building high productivity. Offering reward indirectly means that the employee’s work is recognized in the organization. It’s his proud moment which says that the organization needs his intellectual skills, further. These are some of the ways which increases the productivity by the influence of work environment.Apart from all the above points, the office area should always be filled with positive energy, fun and enthusiasm. Never should a workplace be low-spirited and gloomy. A healthy, efficient and positive work environment is a vital part of the organizational success which increases the productivity and profit of a business. Author Bio: I am Dora Houston, currently working as an essay writing specialist. By the years of experience with different essay writing services, I am able to provide the unlimited essay writing reviews. I am also providing aid to students on career possibilities and other academic success related topics. Besides, I enjoy writing about current trends and innovations in education, confidence, motivation and traveling.